Behold Jesus on the cross. 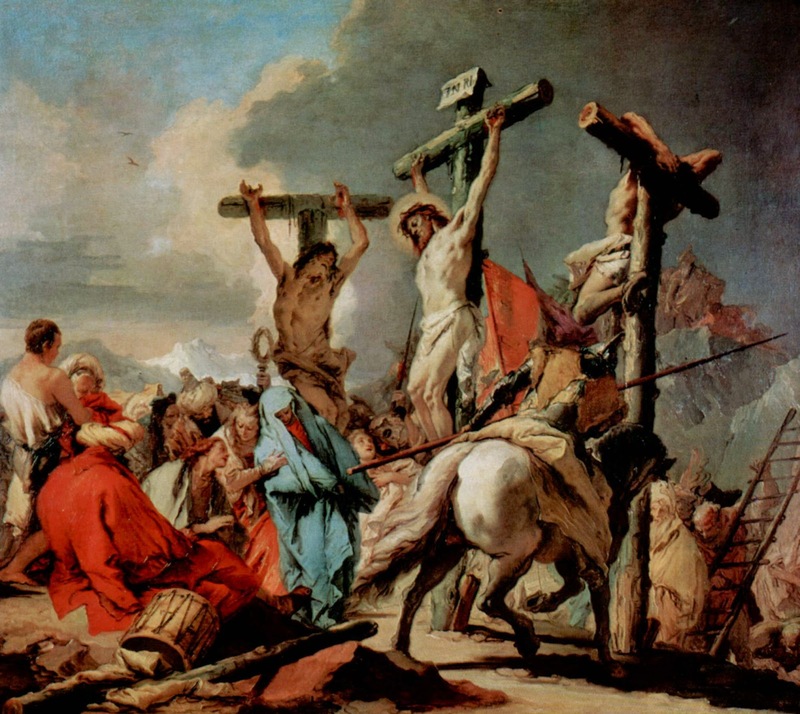 Look upon the condemned Lord, who let himself be nailed to the cross. Contemplate his face, his wounds, and his pierced heart. Look around. Behold those around Jesus. Glimpse at the soldiers, the chief priests, the spectators. Look upon the crucified bandits. Regard Mama Mary, John, Simon of Cyrene, and Mary of Magdala. Feel the cold wind blowing on Golgotha. Remove your sandals, for you are standing on holy ground. Feel the earth beneath your feet. Is it clumpy or smooth? Are there any patches of grass? Hug Mary, the faithful companion of the cross. Feel the warmth of her embrace. How does it feel to comfort Mary? How does Mary console you? Venerate Jesus on the cross. Touch the cross. Kiss Jesus’ feet. What is stirred in your heart as you venerate the Crucified Lord? Smell the wood of the cross. Draw in the scent of the earth on top of ‘the Place of a skull’. The earth might smell a bit peaty or saline. Stay with that smell for a moment. The wind is blowing. A storm is on the way. What does the wind smell like before the rain? How bitter is it to see our beloved upon that cross? What does that bitterness taste like? Did you taste the wood of the cross when you kissed it? Can you taste your own tears? Listen to the people around you. What are they saying? Listen to the soldiers’ jests and to the chief priests’ mockeries. Attend to the cries of the people around the cross. Listen to those who are sobbing. Hearken. Take notice of the last words of Jesus. Who is he talking to? How is your heart moved when Christ speaks from the pulpit of the cross? “Father, forgive them, for they don’t know what they’re doing” (Luke 23:34). How do you need to experience God’s forgiveness in your life today? Tell Jesus. How is he looking at you? “I assure you, today you will be with me in paradise” (Luke 23:43). Do you trust that you will be with him in paradise when the time comes? “Woman, here is your son” (John 19:26). Here is your son. Here is your daughter. What does Mary’s presence at the cross evoke in you? Tell her. How does she respond to your words? “My God, my God, why have you forsaken me?” (Mark 15:34). Do you also feel abandoned? How can you comfort Jesus? “I am thirsty” (John 19:28). How do you respond to these words? What does he thirst for? “It is finished” (John 19:30). Do you trust that God will finish that which he has begun in you? “Father, into your hands, I commend my spirit” (Luke 23:46). End your prayer entrusting your life to the Lord. Ask the Lord, through the intercession of our blessed Mother, to help you enter into that peace which consists in putting your life into his hands. and in your dying may I learn how to live. In a word, may I find all my blessings in your trials.